Started writing this the other day, after the forecast of snow for the night before, chili and more..but never completed it . I'm sure everyone was waiting with baited breath for it :) ...so here it is. Snow? It was more like a a coating of powder sugar on a donut, but yes it was definitely snow. I am not sure why every time it snows my windshield gets coated with snow and hubby's truck seems to have some mystical powers and little or no snow covering his windows or truck. 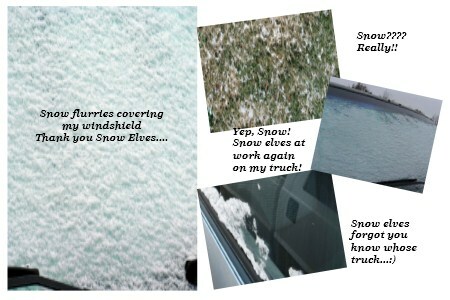 Last winter during one particularly heavy snowfall had at least 3 more inches of snow on my truck than on his. Yes, I did. I measured it. Yes 'indeedy' I measured it. And, another thing, last winter during one particularly heavy snowfall for some reason our entire yard seemed to attract more snow that any of the neighbors. Very, grateful that don't have to shovel the lawn. Think the snow elves just like testing my snow shoveling skills, my stamina, and love filling my muscles with aches and pain. Actually, they are probably testing my body to see, if I have any muscle left. Yes, still have some muscles left, in case anyone is wondering. In spite of all that, I thoroughly enjoy the snow and all that goes with it. For the most part it never lasts very long and it isn't like we live somewhere it lasts for weeks on end. So even though I don't understand how or why it is that my truck is a snow magnet I don't mind when it snows. However, I still think next snow that is in the forecast, will ask hubs to trade parking places and see if my truck just magically attracts the snow or if it is the spot I'm parked in. Curious minds want to know. I am still looking forward to the coming snows which I'm hope will be much more than a kiss and a promise. Looking for that snowfall in which you have two choices making snow angels or shoveling it. Oh, just so you know, this year I am making snow angels. I decided to outsmart the snow elves and have someone hired to do those shoveling duties. The pulled muscles and aching were interfering with my enjoyment of the snow. So, snow elves bring on the snow, we are ready for it. Enjoying the simple pleasures in life such as a dusting of snow. Often pondering the hows and whys of this or that. Mostly, looking forward to the ordinary daily simplicity that life bestows upon us each day. Seeing way beyond what one might perceive as a minor inconvenience. Laughing and seeing the humor in most situations. Understanding that it is the simple pleasures that make up the whole of our lives. Pondering over a simple snowfall that barely covered the ground....loving, laughing, living life.......and thankful for all the simple pleasures in life.